A local firm that held an “investment” account for the Prime Minister’s top aide, Keith Schembri, has been fined €38,750 for breaching a number of anti-money laundering laws, Times of Malta has learnt. In an administrative penalty notice on its website, the FIAU said it imposed the fine after conducting an off-site compliance visit focusing on four unnamed business relationships established by MFSP Financial Management. Documents leaked last year show MFSP established a business relationship with Mr Schembri in 2010. Up until 2015, Mr Schembri accumulated $700,000 in an MFSP investment account, which was held via a once-secret company in the British Virgin Islands he owned called Colson. 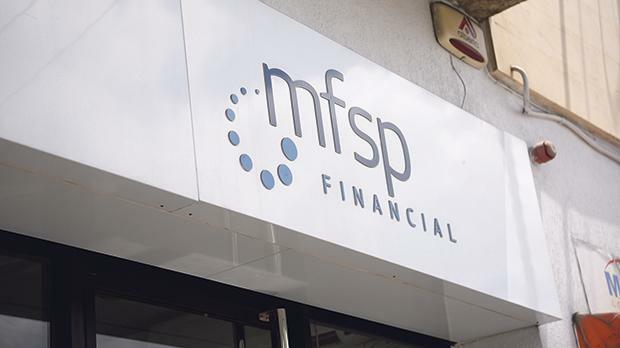 According to an FIAU report leaked last year, MFSP was used by Allied Newspapers’ former managing director Adrian Hillman to receive alleged kickbacks from Mr Schembri. In the penalty notice, the FIAU said MFSP held information indicating that clients’ expected source and origin of funds would consist of savings or the sale of investments. The FIAU found that certain transactions deposited in the investment portfolio came from “third parties”, instead of savings or investment sales. MFSP would have been expected to detect and query such discrepancies, the FIAU said. Additional documentation to substantiate the reasons behind this third-party funding was produced by MFSP last January. “The documentation therefore casts more doubts on the provenance of the funds instead of providing reassurance that the transactions were legitimate and had an economic rationale,” the FIAU said. 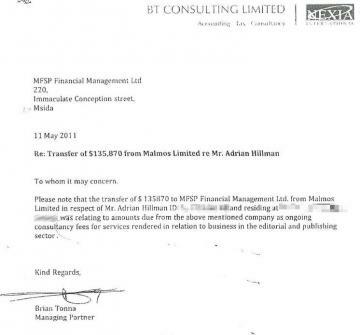 One document leaked last year shows Nexia BT’s managing partner Brian Tonna told MFSP that a $135,870 payment to Mr Hillman from a Gibraltar company called Malmos, which was secretly owned by Mr Schembri, was for “consultancy fees”. The 2017 leaked report showed the FIAU found approximately €650,000 was transferred by Mr Schembri to Mr Hillman between 2010 and 2015. Some of these payments passed through MFSP. The report is the subject of an ongoing magisterial inquiry after it was presented to the courts by former Opposition leader Simon Busuttil. Mr Schembri, Mr Tonna, Mr Hillman and Kasco Ltd's Malcolm Scerri all held investment accounts at MFSP through their anonymously owned BVI companies. These accounts were managed by MFSP director Matthew Pace, who is a government-appointed member of the Planning Authority’s planning board. Their ownership of the companies, as well as the amounts held, was only made publicly known in the April 2016 Panama Papers leaks. All four BVI companies were administered by Nexia BT. The FIAU said MFSP’s on-boarding process for the unnamed cases examined shows it failed to obtain information that would enable it to identify the income levels of its clients. According to the FIAU's notice, the concerns raised by the FIAU in the reviewed cases with regards to MFSP's on-boarding procedures applied equally to any other business relationship that the company established. This was because the shortcomings were of a procedural nature and, therefore, not limited to the cases reviewed, the FIAU said. The FIAU said in its notice that “publicly available information and allegations” should have led the company to intensely monitor the four unnamed business relationships, including the transactions that took place through the business relationships. MFSP failed to submit a suspicions transaction report to the FIAU even though information in its possession together with publically available information meant there were reasonable grounds to suspect money-laundering, the FIAU said. Times of Malta reported last month how anti-money laundering officials in the BVI demanded information from the Panama law firm Mossack Fonseca about Mr Schembri’s and Mr Hillman’s companies.